Tehran / Arrive at the airport meet & transfer to Hotel . AM city tour including ziarat of Emamzadeh Saleh , visiting Tehran Synagogue. A detour to Saad Abad Palace Museum . AM Tehran / morning H/D city tour .After lunch ziarat of Hazrat Abdul Azim. Continue towards Qom , en route visit Emam Khomeini's shrine & Jamkaran Mosque. Ziarat of Hazrat Masoomeh . AM Qom/ full Day visit to the holy shrines , Hoze Elmie Qom theological school. O/n in the best 2 or 3 star hotel. AM Isfahan/ full Day city tour visiting the Isfahan Khan theological school, the Sheikh lotf allah mosque as a mater piece of Persian-Islamic architecture , Imam Mosques, Isfahan eight Eden garden palace. AM Isfahan/ full Day visit to Armenian quarter, Vank cathedral, Isfahan synagogue, continue the tour to Isfahan carpet bazaar , leisurely walking tour along the Isfahan ancient bridges and river. AM Drive to Yazd/ Pm H/D city tour to the Yazd MirChakhmakh Mosque, jame mosque . AM Yazd/ full Day tour to visit the Zoroastrian temples, the ancient burial sites, Yazd fireplace and Chack-Chak sacred site out side of Yazd. AM Drive to Shiraz/ underway visiting Passargade . Persepolis and Necropolis. AM Shiraz / full Day city tour visiting the Shah Cheragh mausoleum, Astaneh Mausoleum, Simon church and shiraz synagogue. AM Mashad / Excursion to Neishabour , visit tombs of poets , Khayyam and Attar & Qodangah. PM ziarat of Emam Reza . O/N at hotel. AM Mashad / another Half Day visit to Imam Reza Shrine. afternoon flight back to Tehran. AM Tehran / Excursion to Bibi Shahrbanoo (Emam Hossein's Wife). PM city tour & shopping .Late evening transfer to the airport for return flight. BOOK YOUR OWN TOUR OR JOIN OTHERS IN SMALL GROUP TOURS! Join other PersiaTours customers on one of our "Small Group Tours"! . This option is prefect for those who want to be in a group tour package. Each small group contains no more than 16 and no less than 2 participants, except those who rather to travel in a solo private guided tour. Your chosen date will be confirmed only if there will be at least 2 or more people interested in the same date. You will be notified about the status of your tour at least 30 day in advance. All charges will be refundable to you in regard to this tour unless the minimum number of participants for this tour is reached and you are totally sure you wanted to join your tour. But still if at any point prior to 3 week until your tour date , you decided to cancel , we will refund you in full. Because of the nature of shared tours departure times are fixed and cannot be altered. please be advised that if you change your travel date without prior notice, you will lose your reservation and any possibility of a refund. Traveling alone? Tight budget? Want to explore the country on your own way, love to improvise !. Enjoy the same quality of full guided tour service and save a lot ! We will get your visa, help you to design your tailor-made itinerary, assist you to chose your accommodations everywhere , doing research and give you tips, discuss the need for guided tours in any city, hock you up with right guides or good drivers ,wherever you need. For all that, what we get is the visa service fee and a consultant fees. This in turn however would eventually save you lots of intrinsic hassles that such a travel would have for anyone, especially in Iran and of course hundreds of dollars, which otherwise would be paid for things, which really don't needed to incurred at all. So let us know if you are interested. 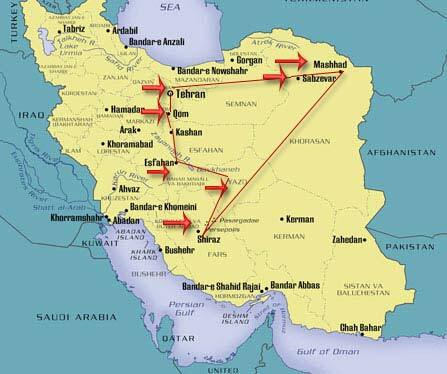 :: Why does Iran Traveling Center charge for trip planning services? Nowadays there are many tourists that tell they would rather simply to just get their visa through us and then manage their travel arrangements independently, while traveling. We recognize and always have welcomed this notion. On our turn we would also do our best to serve this group of tourist as efficiently as possible. so if you happened to be merely interested in getting your visa to Iran through us , please don?t hesitate .We will try to get a tourist visa , valid for up to 30 day travel in Iran for the nominal cost of 60$ per person. *100$ Deposit Per Person is charged if you fail to participate in the tour you had prescheduled based on the date you set. :: All prices are in US dollars. - prefer Single Room (will pay the Upgrade supplement). - contact me for pre/post trip reservations. Why am is seeing this? In order for us to differentiate the automatically sent spam mails form authentic human filled ones. If you have an interest in this tour, please contact us for additional information on procedures and costs.